Update: Bumptop is now live. Go out and purchase yourself a copy of this amazing app. First and foremost, I’m a Luddite and a minimalist when it comes to computers, technology and new software gadgets. I’m probably the only Graphic Designer not using a Mac and still pushing pixels through XP. It took me four years to get an iPod and I’m still working with Creative Suite 2. I like my taskbar to have less than three icons on it and I can’t stand personal pictures as desktop wall papers. It’s got to be clean, slick and minimal for my archaic tastes. So when I heard of Anand Agarawala sweet love child of a creation BumpTop, I was some what skeptical. I’m not a fan of organizational gadgets, but Anand’s a solid man and I trust he wouldn’t be frontin no garbage. Therefore I went into the beta test version with a fairly open mind, but somewhat skeptical. Therefore I find it really interesting that I absolutely love this application. In fact I’d called it Freaking Spectacular-spectacular! First off here is my usual desktop. Plain, cluttered and filled with downloads. (Embedded iTune tracks, shortcuts, etc.,) It’s a mess and it drives me up the wall. I try vigorously to keep it clean; but when your constantly downloading fonts, zipped files, and badly named client files the clutter tends to build. … And here’s the same desktop via the BumpTop interface. Besides the crisper look, I found that Bumptop actually improves the functionality of my desktop. I know it sounds weird, but it’s true. First and foremost, Bumptop allows users to pile files in cool like stacks. As you cans see, I was able to replace the cluttered groups of Zips and Itunes tracks and neatly pile them in the top right hand corner of the screen. Next Bumptop also transforms any image files on your desktop into little thumbnails. While that might seem like a bit of a pain, it does a fantastic job in deciphering those annoying JPGs that always seem to pile up on my desktop. (Plus as you can see I’ve add a cute pictures of Merlin and Caitlin to the walls of my desktop). In my work, I constantly run into organizational problems when downloading 15-20 stock photos from istock. With such creative files names as Istock001020102.jpg for each photo, having a thumbnail preview can greatly reduce organizational time and confusion. Probably the most fun and entertaining feature of BumpTop is the actual physics of the application. After a bit of use, you really start adjusting to the properties of BumpTop’s flowing icons. Getting lost in swinging files around and sliding them into neat piles. It’s fun and actually a bit productive. 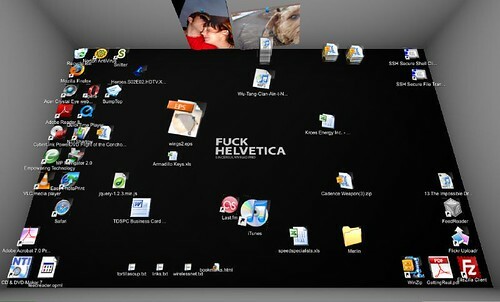 After a while it just becomes a naturally human way to organize your desktop. Anyways, I could go on about the cool little features of BumpTop, but you can find them at other sites. Plus I thought these two little functional examples would go a long way in describing it’s greatness. So the main question is do I still use BumpTop? Simple Answer – A resounding yes! I mentioned it before, but I’m not a fan of change or gadgets. So after testing it out for a few hours, I tried to remove it from automatically loading on my desktop. But it quickly grew on me. To the point that I run it continuously. 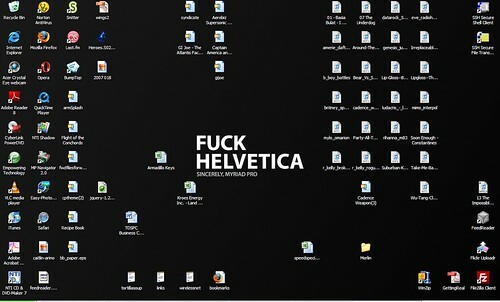 It’s great application, in which I can see beginner (i.e your fragile old mum) and expert users (pixel pushers) utilizing to better organize their desktops. It’s still in beta mode so I anticipate some correction to a couple transparency issues and some compatibility changes. But on a whole Bumptop is a fantastic little app. If your interested in beta testing it send go to the main BumpTop site and sign-up. P.S. Anand I still covet those IHeartNE T-shirts man. AS a sidenote Comments for this article were lost in a ridiculous Spam incident two months ago. Due to the traffic increase from Lifehacker, i have reopened the comments. So please feel free to leave a note. Especially if your curious about Bumptop and it’s amazing functionality. Hey buddy, that’s a sweet dog in that picture! can you share your invite code for me? i’d like to try it!!! send it to my yahoo! thanks!!! I’m not passing out bumptop Invite codes. The service is now outta Beta and a free version can be downloaded at Bumptop.com.